New Growth Group and MJ Crocker and Associates partnered with Cuyahoga Community College to explore the role of the employer in addressing current skill gaps and the emerging Industry 4.0 trends. The project team used a framework to identify and analyze manufacturing workforce programs that exemplify best practices, resulting in sustainable partnerships with measurable outcomes. 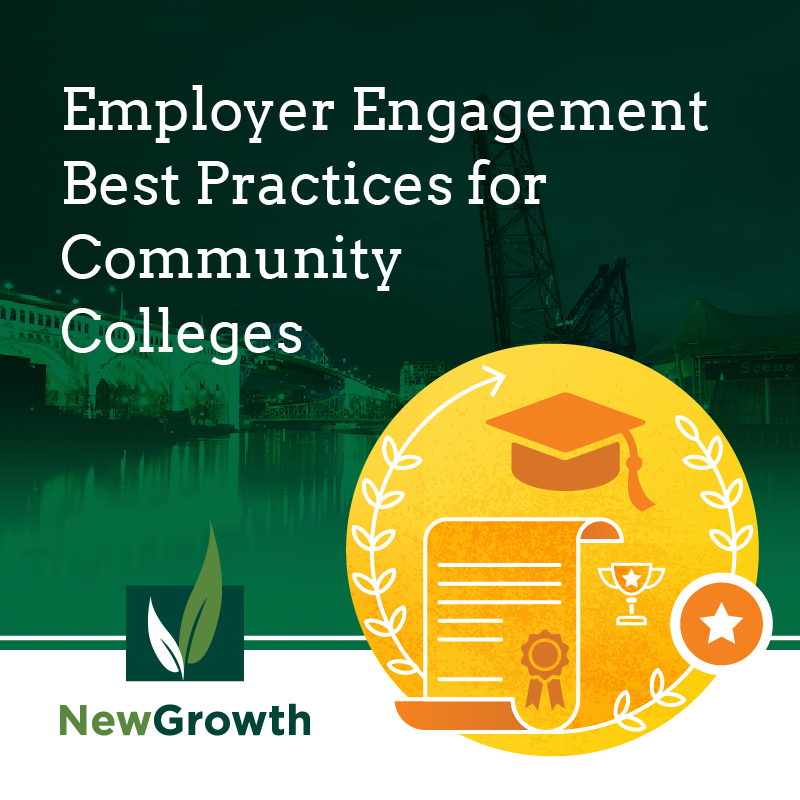 The Employer Engagement Playbook was created from this work and is designed to guide community colleges in collaborating with employers and other key stakeholders to meet current and future workforce needs. Nikki Glazer Stoicoiu recently presented the findings and introduced the Employer Engagement Playbook at the National Coalition of Advanced Technology Centers Conference. This blog summarizes the presentation. Proactive and willing to identify goals and needs when engaging with peers and partners when seeking solutions. Actively involved in at least the program design, delivery, and hiring graduates. Committed to assisting in data and continuous improvement efforts. Committed to the graduates who have mastered the content and are now candidates for employment and/or promotion. Identify key staff person/office to be single point of contact and lead the college team. Partner with companies to assess current needs and identify projected future skill needs to influence program content. Introduce research-based programs and delivery models that may impact student outcomes and address employer workforce demands. Assist with job description review and job analysis to ensure knowledge and skills are clearly identified and validated by SME’s and included in program outcomes. Engage peer institutions as part of the conversation to help employers access existing training content to quickly respond to needs. Facilitate employer meetings and discussions. Work with individual employers to customize training, and connect smaller companies with similar needs and challenges. Effective employer engagement is not a linear process, but a dynamic cycle which involves the several participants including community colleges, partners and employers. Continuous improvement is key to the overall success of a program, initiative or strategy, and is symbolized via the Employer Engagement “Cycle”. 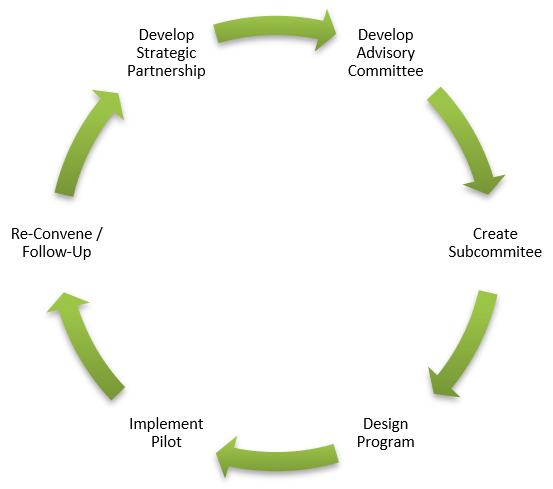 When using this dynamic cycle, the strategic partnership of community colleges, businesses and community- based partners ensure that there is a process in place for a feedback loop with existing committees, leading to replication and sustainability of programs. Develop Advisory Committee: In this step the college convenes and facilitates a group of employers and community partners which identifies common hiring and advancement needs. This discussion should lead to the development or adaptation of current training programs and substantive commitment and participation of key personnel from employers in the ongoing process. Create Subcommittee: Once new program or needed programmatic changes are identified, the college should establish subcommittees that specialize in the different facets of the program. In the subcommittees employers should determine specific knowledge, skills, and abilities needed to fill their business needs. This information will help the college build and tailor the program to the needs of the local labor market. Design Program: Using the key skills, competencies and credentials identified by employers as a guide, the college should develop and/or enhance curriculum to meet the needs of employers. Here employers should review and confirm the curriculum. If the program contains a work-based learning component, it is critical to secure commitment to host interns or apprentices at advisory committee employers. Implement Pilot: Once the college has confirmed the program curriculum and work-based learning experiences with employers, it is time to launch the pilot program. In this step, colleges, determine the program’s funding source, recruit and enroll students, and deliver the program. It is important for employers partners providing work-based learning experiences to provide feedback on student progress to the college. Engaged employer partners may also offer tours, speakers, or provide SME’s to participate and lead class discussions. Re-convene and follow-up: After the pilot program has concluded, it is important to evaluate and to reflect on the lessons learned. Here colleges should review outcomes data to determine effectiveness and impact such as hiring, retention, etc. Employer partners are key to this review and should provide data on outcomes they have collected. Armed with this information and hindsight the employer should recommend revisions to address program issues and the college can determine if program revisions are needed in content, format, recruitment, selection, delivery, and student follow-up. Develop Strategic Partnership: As the program adapts and changes to employer needs, the college should make efforts throughout the lifespan of the initiative to develop and sustain a continuous improvement feedback loop. This feedback loop will help the college share and possibly replicate the initiative with other colleges and/or other departments within the college; facilitate ongoing engagement with employers; and assess the sustainability of the initiative. Employer engagement is critical to the feedback loop, and employers should commit to ongoing participation with the college, and promote the value of the partnership. For a more in-depth look at employer engagement at community colleges check out the Employer Engagement Playbook and the Aligning Advanced Manufacturing Programs to Address Skill Needs Report.